Sundays for us generally mean doing something together as a family. My husband works long hours in the week and Saturdays are normally football orientated so when Sunday rolls around we always like to have a nice day out. And especially as the weather has been amazing! 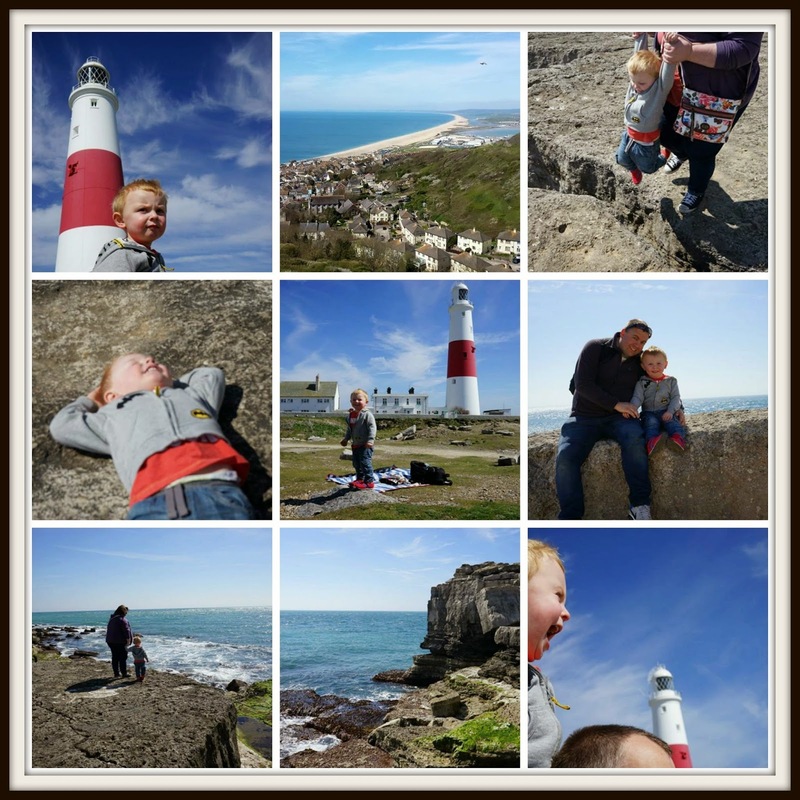 Last weekend we decided to visit Portland which is the southernmost point in Dorset. And if you're looking at a map of the UK, its the bit that sticks out like a little foot! 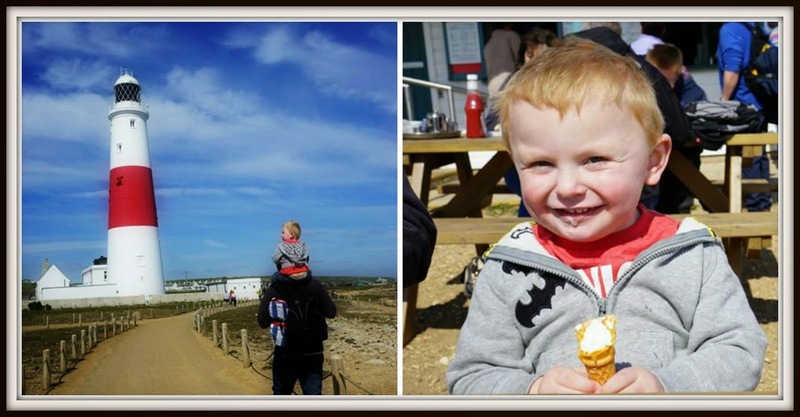 As you've probably guess from my previous posts, Elliot is a big fan of anything animal related and most of our days out centre around something animal-y! This time we decided to visit a place called Fancy's Farm which is a community farm and free to get in (they rely heavily on donations). 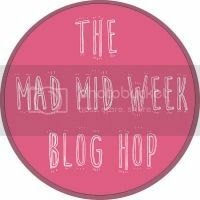 We weren't really expecting too much from a free entry location but actually, we were pleasantly surprised! The first animals we spotted were some horses, including a friendly shire horse who was being fed grass through the fence by some passersby. We grabbed some handfuls of grass and let him take it from us and he was so cute, he'd eat the long grass and then stamp his foot as if to say "more please!". I'm not usually a fan of horses (they scare me a bit!) but this one was very friendly. 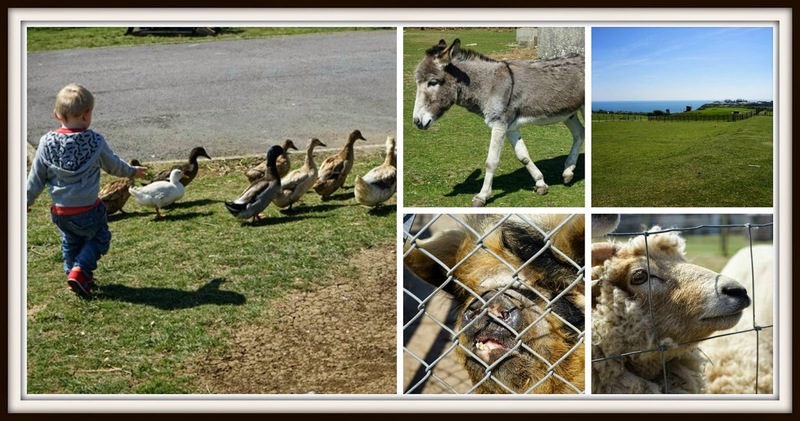 The farm had lots of animals for us to see and they actually sell food for a £1 so we could feed most of them. The goats were funny - they came running over as soon as they spotted a cup of food!! Elliot was a bit unsure at first and most of his food ended up on the floor but he soon got the hang of it and found it hilarious when the goats tickled his fingers whilst nibbling the food! There were lots of sheep to feed plus chickens, peacocks, wallabies, donkey, rabbits, pigs, ducks, geese...plus a friendly farm cat which Elliot took a shine to! We spent a good hour and a half wandering around looking at the animals and the views are amazing being that it's the highest point on Portland. After resisting the temptation to buy a bacon roll (pigs reared onsite!) we drove a few minutes down the road to Portland Bill, one of three lighthouses on the island. We had a picnic and had a nice little walk around the lighthouse. We would have liked to have gone up it but it cost £7 per adult which was a bit pricy so we admired it from the bottom! We couldn't go home without having an ice cream so Elliot decided on a mini milk..but after scoffing that he made a start on my Mr Whippy! I love the idea of a community farm, great for little ones to be able to get up close with the animals and not feel you have to pay a fortune too. A real bonus being by the coast too and I love the look of the lighthouse there, I really want to take my kids into a lighthouse one day. Thank you for sharing your day out with me on Country Kids. I can remember going to Portland Bill as a child, I'm pretty sure it was free to go up then...but I'm talking quite a few years ago! The farm looks lovely and your little man looks like he had a great time.